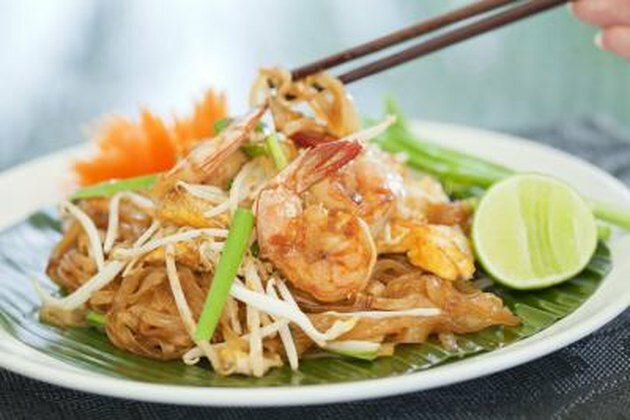 With its nutritious bean sprouts, thin noodles and lean tofu, pad Thai may seem like a healthy choice; however, the calories can add up quickly in large restaurant portions. If you finish your whole plate, you'll have consumed about 940 calories, which is typically too many for a single meal. To spare yourself calorie overload, split your pad Thai with a friend or take some of it to go. To find out how pad Thai fits in your calorie budget, estimate how many calories you need in a day. According to Harvard Medical School Health Publications, a moderately active adult -- meaning someone who spends about 30 minutes a day walking briskly, mowing the lawn or performing similar activities -- burns about 15 calories per pound, per day. Using this formula, a 145-pound person burns about 2,175 calories each day. A full restaurant order of pad Thai would make up 40 percent of those calories, while a more reasonable half-order would make up just over 20 percent.